Literally, temple means a building built for worship of Gods or Goddesses. The Golden Temple is such a temple of the Sikhs. It is situated in Amritsar, a north western town of India in the state of Punjab. 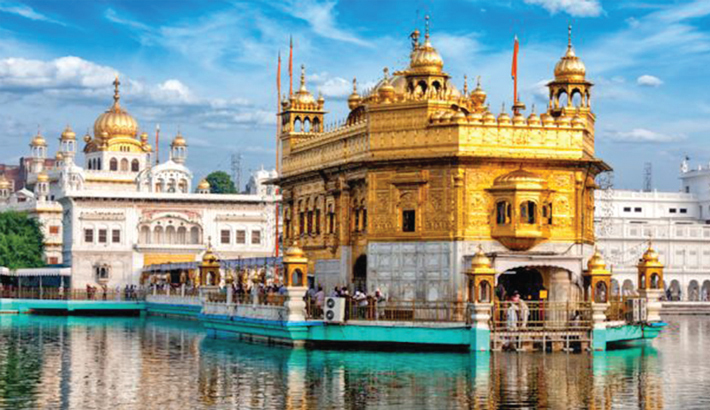 Along the passage of time, now-a-days Amritsar and the Golden Temple have become almost synonymous. The word Amritsar has also a theological origin. It is a combination of two words – amrit (nectar) and sar (sarovar i.e. lake). Mythologically it is believed that by drinking nectar one can gain immortality and sarovar or lake is a place where water is stored naturally or artificially. So, Amritsar, as per literal connotation, is the tank of nectar and immortality. In fact, the sacred Golden Temple is a small part of a huge gurdwara complex, commonly known to Sikhs as Harmandir Sahib. As believed by Sikhs, any place, a room in a house or an entire building or portion of it, where the Guru Granth Sahib ( the main scripture of the Sikhs) is installed and treated with due respect, devotion and solemnity, can be termed as a Gurdwara which can easily be identified from distance with its tall flagpoles bearing the Nishan Sahib i.e. the Sikh flag. Among hundreds of Gurdwaras all over the world, Harmandir Sahib of Amritsasr is considered to be the largest and the most important one. At early days of Sikh religion, places of their worship were known as dharamsala ( place of religious asylum where food and shelter was provided free of cost). Guru Hargobind introduced the word Gurdwara (the gateway through which one can reach the Guru) and since then all Sikh places of worship are termed as Gurdwaras. Spiritually, a Gurdwara is not only a building but it has other purposes also which are mainly - it is a place to learn spiritual knowledge, it is a place for holding religious festivals, it is a place where Sikh children learn the Sikh faith, ethics, norms. customs, traditions and texts, it is also a community centre and offers food, shelter free of cost and companionship to those who need it. All activities in a Gurdwara are managed by a committee and functions of the Golden Temple are supervised by Shiromoni Gurdwara Prabandhak Committee ( SGPC, supreme committee in charge of temple management) which is formed of persons from Sikh community. Name of their office is Teja Singh Samundri Hall which is adjacent to the langar kitchen. This office coordinates and supervises the operation and activities of main temples of the Sikhs. Introduced by Guru Nanak, the first guru, there are other gurus (who can teach their disciples and followers) in Sikh religion. Amritsar town was founded in 1577 by Guru Ram Das, the fourth Sikh guru and Guru Arjun Dev, the fifth guru, designed Harmandir Sahib to be built at the centre of this tank. After construction in 1604 he placed a copy of the Adi Granth (the holy scripture of the Sikhs) inside the temple and Baba Buddha ( not Gautam Buddha) was appointed as the first Granthi ( the reader and custodian). Since beginning of construction the Golden Temple became target of outsiders and several times it was destroyed by foreign invaders. Even once gunpowder was applied to demolish it but after every invasion it was rebuilt. Destruction and reconstruction are two essential concomitants of Harmandir Sahib as well as the Golden Temple. After repeated destruction the Golden Temple was rebuilt for the last time in 1830 with marble, copper and gold by Ranjit Singh. Due to construction at different times the Golden Temple has lost its original appearance (which is not possible to know because there was no scope of photography then) and has come to present shape. From constructional point of view the Golden Temple itself is a unique combination of Hindu, Rajput and Islamic architecture with an elegant bottom layer made of marble stone. At the southeast end of the tank there is the Ramgarhia Bunga (a mini fort built for protection of the complex) with two minarets (a tower like part of a mosque from which Muslims are called for prayer) of Islamic design at the top. Inside that minaret there is a stone slab which was once used for coronation of Mughal emperors but Ranjit Singh collected it in 1783 from Delhi. The Harmandir Sahib complex is also home of the Akal (kal means time, akal means timeless i.e. God who remains beyond the range of time) Takht (the throne of timeless one i.e. God which was formed by the sixth guru, Guru Hargobind ). While the Harmandir Sahib is regarded as the abode of spiritual aspects of God, the Akal Takht is treated as the seat of God’s authority on material and worldly affairs.